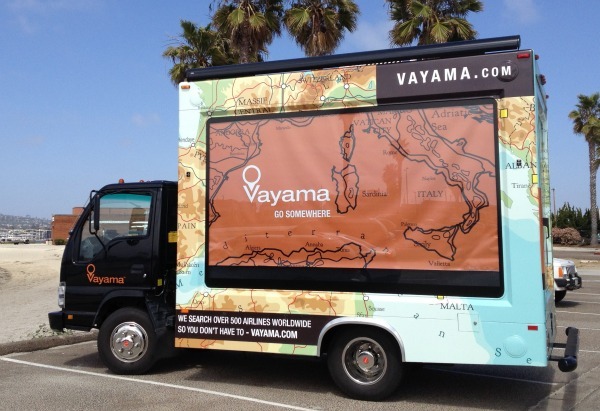 Beyond Traditional partnered with Seattle-based agency Curator PR to launch the Vayama Go Somewhere Tour for the international-focused online travel agency, Vayama. The focal point of the 12-city mobile marketing campaign is the custom-designed Advertising Vehicle, offering a unique experience and inspiring people to think about international travel. Attendees at some of the nation’s most widely attended cultural events, food fairs and lifestyle expositions will be invited to interact with the Vayama experience through three elements: a passport photo booth, an international trivia game and an interactive iPad app. The passport photo booth presents people with a tangible takeaway as part of the first steps toward making their dreams of international travel a reality. Event attendees will be able to have their official passport picture taken and printed on-site within minutes. Event-goers will also be able to challenge their family, friends and strangers in a game show about international trivia. As questions are displayed on an 80” outward facing TV mounted on the Ad Vehicle, participants at iPad podiums can scroll through multiple choice answers and lock in their selection, earning points with each correct answer. At the end of each game, participants will be prompted to enter the Go Somewhere Sweepstakes for a chance to win an international trip. Additionally, attendees are invited to step inside the vehicle to interact with a custom-created iPad app, allowing people to navigate an interactive map to learn compelling facts about different cities around the globe, see beautiful images and watch picturesque time-lapsed videos. Users will also be able to enter the Go Somewhere Sweepstakes from all iPads set up in the interior of the Ad Vehicle, as well as their personal smartphones. The Go Somewhere Tour has officially hit the road as of April 12, so click here to find out where you can catch the Ad Vehicle in-person. If we miss you on the tour, not to worry, Vayama has invited all Facebook users to participate in the Go Somewhere Sweepstakes for a change to win the Grand Prize – an international trip valued at $5,500. A lucky winner will receive two round-trip air tickets on Emirates Airline, plus US $2,000 spending money! Enter before August 4, 2013 at Vayama.com Facebook page.